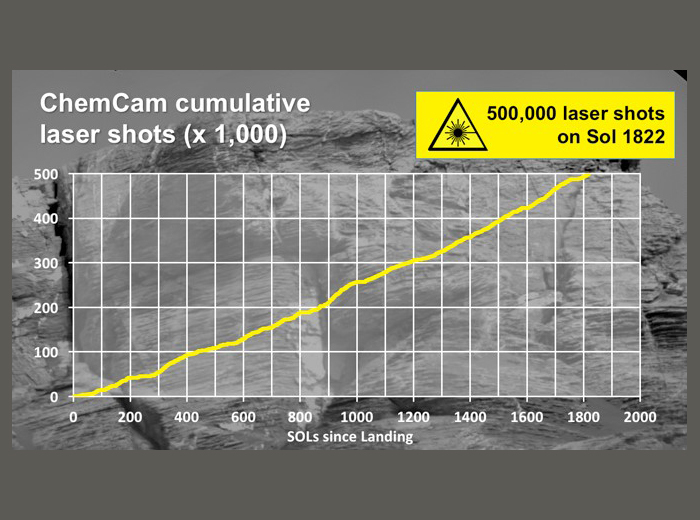 September 22, 2017 – Late Tuesday, the ChemCam instrument that sits atop NASA’s Mars Curiosity rover fired its 500,000th shot at a Martian rock. That’s big news for the ChemCam team at Los Alamos National Laboratory, which developed the instrument in conjunction with CNES (Centre National d’Études Spatiales) in France and continues to help direct operations. Data collected from ChemCam has helped quantify elements like hydrogen, boron, and manganese in Martian rocks, which revealed that the Red Planet was habitable in its ancient past. By firing intense pulses of laser light at distant targets, the ChemCam (Chemistry and Camera) instrument uses a technique called laser-induced breakdown spectroscopy to measure the chemical content of the rocks. The laser beam vaporizes a pinhead-sized area on the target up to 25 feet from the rover. A telescope and spectral analyzer then peers closely at the flash of light from the vaporized sample. Atoms ablated in ionized states emit light and each sample yields spectral emissions at unique wavelengths, revealing the elements present in the material. Like fingerprints, the emission line wavelengths can be matched to a library of known chemical compounds. The rock that was targeted with the half-millionth shot is called “Mustards Island.” It was shot on Mars day 1,821 of the mission. It is a small, dark pebble, possibly a meteorite fragment, lying near the top of the 150-foot-tall Vera Rubin Ridge, which the rover began climbing earlier this month. Over the course of the five years that the Curiosity rover has been on Mars, approximately 15,000 small laser pits have been blasted in rocks and soils. ChemCam has also taken more than 10,000 pictures to document the laser work. The science team has published more than 50 papers on the results of ChemCam’s observations. The ChemCam instrument was conceived, designed, and built by a U.S.-French team, led by Los Alamos National Laboratory, the Jet Propulsion Laboratory, and France’s Centre for the Study of Radiation and CNES. Los Alamos’ work on discovery-driven instruments like ChemCam stems from the Laboratory’s experience building and operating more than 500 spacecraft instruments for national defense.